Racing one week after another is proving to be an enjoyable experience. June is race month for me and I am using all the short races as part of my build block for the end of July where I now plan to compete in Antwerp 1/2 ironman. I did Antwerp before and I think it will suit my strengths and Im gunning for a top 5. Waterford ‘Hook or by Crook’ Sprint distance was being held on Saturday. But before that I raced in Cuchullains 10 Mile Time Trail in Dundalk on thursday that also was the Leinster champs. Falling asleep all day at work after my morning session and the weather storm like I didnt have the heart for it but I wanted to do a 10 tt as a trail for my power numbers. I finished 2nd, some 6 secs back from Ryan Sherlock. I think my handling cost me on the way out to castlebellingham. A shallower rim would have been a better option but coming back for the final 5 mile I reached speeds of 55kph. I was happy with the data my computer gave me and shows that my power is up a little. I swam well and happy with my effort. With the race not being a piority I tried a couple of different things. I concentrated on quicker turnover and I thought i swam a good line. My Sailfish G range felt super smooth. I came out confident I had a quick time. The forecast was for rain but whilst on the bike I was wondering did I need my factor 20. The sun stayed with us. My last two races my transitions were very poor and clipping in was a problem so I tried to be as quick as possible. Another tick and I was happy with my bike mount and I soon was on the road trying to catch the guys. Doing a race you are not fimilar with is difficult because visualizing and gauging effort is hard. Knowing corners and how to approach them is another bonus i didn’t have. I wouldnt say I had really good legs but given that I was packing my week with race efforts I wasnt too concerned. 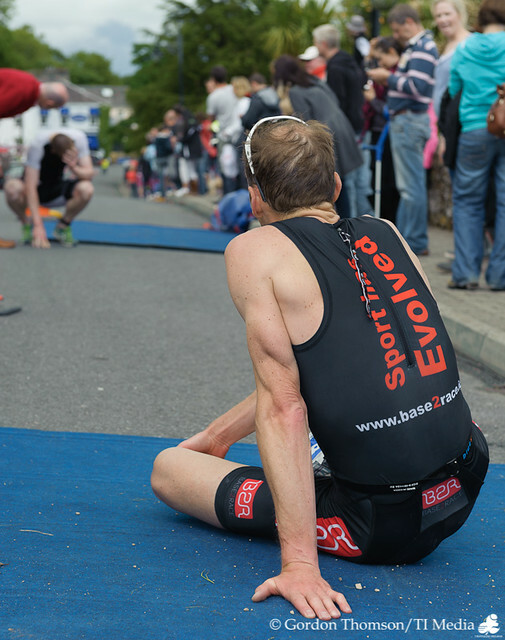 ‘hit it hard and leave nothing on the course’ was my race brief from my coach Rob Griffths. What suprised me was that I had caught the guys around 12km in the bike. I was in the lead and Trevor was right there. He upped his pace after I past and we rolled into tranistion around the same time. My T2 was slow but I ran out right on Trevor’s heals. This is where it got interesting. We both got into a rhythm and ran side by side. I pushed it ever so slightly and he came. Okay, i said.. Lets try something new!..The run was 7km with the first 2.5 km uphill. It was tough but we kept it steady. You have to race your own race in sprints, lay it down. But myself and trevor ran this as if it was an ironman. Chatting keeping an eye on 3rd place between stephen and shane. I made a little push but trevor wasnt showing signs of fatigue. There I made the decision to go for the win at the death. Funny thing is Trevor probably decided the same. I figured 40 years wouldnt be fit to out sprint 30 year old!! With the finish insight on a little incline trevor took me by suprise and nailed it. I responded but my legs didnt have the quick kick trevor had. We gave everything to the line and trevor was the stronger man. With both of us totally spent and lying on the floor a marshal told us we hadnt crossed the finish line. We botched stopped at the first mat. We then had to walk over the second mat after we picked our lungs off the floor. It was another great race to finish off a solid weeks training. Next up is Hell of the West Olympic distance race. Its a funny one, I’d love to win it but I have to remind myself of my main goals and keep the pressure on in my sessions. It was tweeted that I was going for the national series title with my race selection. It didn’t enter my head until now and it has me thinking…Maybe I will!..